Discussion in 'Forza Horizon 4' started by GTPNewsWire, Mar 20, 2019. 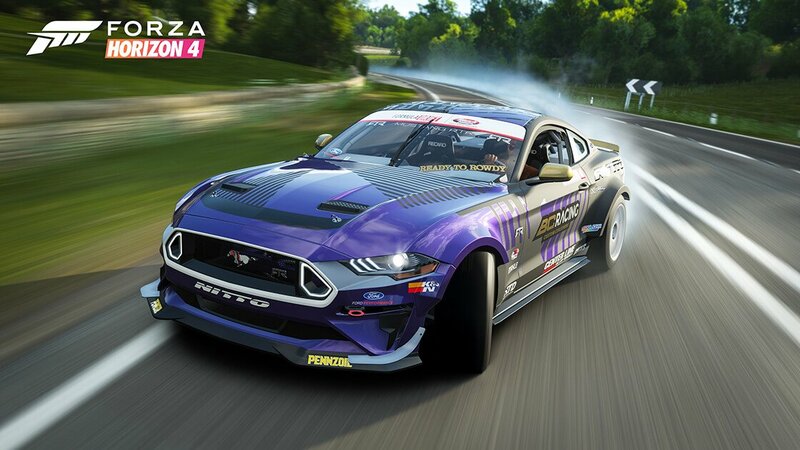 This article was published by Joe Donaldson (@Joey D) on March 20th, 2019 in the Forza Horizon 4 category. KiroKai, LotusEvoraGTE, RandomCarGuy17 and 6 others like this. Strange... Horizon is going the opposite way as FM7. In FM7 they unlocked content, in FH4, they lock it away. No doubt the community will make them backpedal. ferhound, JoshMead, VXR and 15 others like this. I can feel my mental health deteriorating when trying to do the team races and ranked adventure, and I’m up against a team of 6 professional drivers in Bone-Shakers vs. my teammates that don’t know how to drive. I’ll just take a break. bremics and SVPSkins like this. I fail to see how the "play your way" phrase comes into it. Seasonal rewards were always locked behind certain requirements with little freedom to navigate. The problem here is simply the sudden and large amount of challenges to wade through. Simply put FH4 is a backwards step over FH3. The formula was perfected in FH3 and has for me slightly regressed from that high in FH4. The soundtrack is uninspiring, cars too expensive and worst of all it all feels a bit too similar to the previous titles. The big change, the weather system is just a gimmick that doesn't really have much effect. FosterG, VXR, huiop2 and 8 others like this. It's good to see GTP not shying away from putting this on the front page; the more attention that it receives the more feedback PG have to act upon. I've literally stopped playing the game because of this change, I see no reason to head back to it which is a shame as I bought the Deluxe Edition and the 2nd DLC pack is yet to arrive. CSLACR, Jetboy., huiop2 and 21 others like this. Could you make an article for Gt sport where daily races became weekly races which is one of the biggest mistakes they ever made? I've manage to get 100% but in no way was it fun, i will not be doing the remaining weeks worth. PG really have made right boo boo adding this feature. I enjoyed the game, not so much now. Time for PG to rethink this and actually involve us before they release any more features. huiop2, vinz7531, CaptainTNT and 6 others like this. Can't wait for the change when it comes, because honestly, I despise being forced to do things in video games as well. huiop2, bremics, sangdude82 and 7 others like this. I agree, when it becomes a chore it ceases to be fun. I have a nice toy in my garage, think I'll go drive it a bit, I hope they make some adjustments or this one will backfire big time. huiop2, bremics and TokoTurismo like this. Another problem with this update is that if you play other games as well as FH4, you have to remember to do the Festival Playlist as well. I play FM7, FH4, The Crew 2, and other various games. I didn't play much FH4 in the past week. I have to work tonight, and I'm not sure if I'll be able to get 100% on summer. A possible solution is to keep the 50% and 100% goals, but require less to attain those goals. Other people have kind of said what I've just said, but I just wanted to say it again. bremics and WanganDream like this. Funnily enough, I originally agreed with this sentiment, and I still believe "daily races" is a huge misnomer. That said, there's an argument for the weekly approach since it allows people to really invest in a combo. What would be a better solution overall would be multiple different events with varying lengths of active time. In other words: more than three events, PD. I've snapped up the 50% — and yeah, it isn't too hard to accomplish, especially as most of the progress can be made with quick jumps or speed traps. But it's the slog of racing online, and the luck involved with it, that will likely keep the 914/6 out of my hands. Now, if it's also included in wheelspins after this, that's slightly better, but still not exactly a great solution. Maybe we as racing game players are out of the loop. Is this sort of timed exclusivity by way of grinding common in the FortUBGs of the world? I wouldn't have the foggiest. It just strikes me as a pretty blatant hook to keep gamers playing, but not necessarily having fun. I saw this and thought “this literally takes the fun outta earning these cars.” They need to fix this. Lowering the percentages to earn the cars is a good idea. Another issue with the Playlist is that it makes it hard for those (including me) with jobs, school and life outside of gaming. I work fulltime and barely got the Mustang. raven214, ykiki, DK and 5 others like this. Regarding this, I adore FH4. I said it during its beginning and I’ll say it now, normally I’d love to do some sort of challenge playlist like this but due to the fact I have to play every single day as well as do multiplayer events such as the mini games my attitude towards this is I cannot be bothered which is a shame I really would love those cars. Hopefully they’ll rethink this playlist idea to change many opinions on it and maybe offer up the current prizes as Forzathon shop vehicles. HarlemG27 and L8 Apex like this. This sort of 'hook' is not really a thing in console racers (barring FH4 atm, and to a lesser extent, FH3), but it's everywhere among mobile racing games. The most recent Asphalts, CSR2, and NFS No Limits lure ya with time-limited exclusive cars. Usually, I'd grind my rear off because I want all those shiny new cars in NL, but I don't necessarily enjoy the grind. In fact, it's a bit like a chore. With that being said, I don't exactly love this 'play-everyday-or-you'll-miss-it' thingy. IMO it's a form of psychological manipulation, and it's rather insidious. CSLACR, FosterG, HarlemG27 and 1 other person like this. Reaching 50% isn't impossible, if, like me, you don't do online stuff, but you still have a number of hoops to jump through. With the previous system you just had to do win one championship to get the prize vehicle. You could ignore the other ones which just had woolly hats etc for prizes. Now not only do you have to do all three, but also two of the three PR stunts. I just made it. One of the stunts, the speed zone, was beyond my talents and patience. This development seems to be the product of executives who are good at getting bad ideas. Objectively speaking, the reason Horizon 4 is a step backwards is because of removed features like being able to create your own Bucket Lists and championships, forced team Online Adventure at launch, a club system that doesn't do anything and daft decisions like the Festival Playlist. While it did add a few new things like seasons and seamless multiplayer in free roam, this isn't enough to make up for what was lost. That being said, Horizon 4 has a good foundation and I still enjoy playing it for this reason. But if things keep going in this direction, I'm going to quit buying Ultimate Editions of future Horizon titles. Maybe even buying on release day period. FosterG and HarlemG27 like this. I like the suggestions that are given at the end of the article. I'm really disappointed with the way things currently are. They should lower the 100% car to 60% and the 50% car to 20%. Give players the option to play they way they want at the very least. This just feels like competitive multiplayer is being forced down our throats and I hate it. Jewlz1k and palqo like this. This is so frustrating. For the first time in my life I've been holding off on a major car game until further improvement. I was so close to buying this game, but they give another reason just to give it a pass. I traded GT for Forza a long time ago, as they seemed to really make an effort to make the game enjoyable, rewarding and fun. But also a huge effort was placed on their cars, customization, sound and in-game progression. After the last two or three titles, Forza seems to be in a crisis. It's almost as if they don't know where to take the franchise anymore, and what ultimately made me fall in love with it is suffering greatly. Forza titles almost seem uninspired and a mess of recycled assets. T10/PG needs to stop making games for a while, sit down and rethink. Time for me to go back and keep an eye on PD. JoshMead and funkydunk like this. I don't mind the changes they've made to the UI for the Festival Playlist, it's actually a lot easier to navigate. That can stay. However, I feel most of the changes they've made to the game since launch has been 1 step forward, 2 steps back. None of it has improved quality of life, and this latest update has actually made it far less enjoyable to play. I didn't mind the "grind" to get credits, skill points or cars since launch, at least there are/were ways to make that interesting and fun. Locking away the highest completion percentage event behind a) online only and b) having to do an absolutely insane amount of races to both unlock the progression and then complete said challenge is not only ridiculous and frustrating , it borders on EA levels of incompetence. I'm lucky enough to have a lot of free time on my hands, don't play much other games aside this one for now, and as such I was able to complete everything, but not everyone is in that kind of situation. Having to do a minimum of 50 races just to complete the online adventure part against other players that might as well be 5 year old kids was a mind numbing exercise that took me at least 8 hours over the span of 2-3 playing sessions to complete. 8 hours. For a single "challenge". That's on top of all the waiting you have to do in order for the game to sync you with other players before entering a lobby (which I've seen go up to 3-4 minutes!) I mean, sure, you get a good chunk of credits out of it, but I can get credits in other ways that are at least a bit more fun. I also feel like the rewards aren't exactly as good as they should be considering the amount of effort it takes to get them, but that could only be my own tastes. FerrariF1GT, DK, KiroKai and 3 others like this. I liked 914 more than 911, but I didn't have time to play the daily challenge and was fed up with the online adventures disconnect bug. Perhaps I can not get the 65 GTO. It's very painful to know that I can not get the car I particularly like. I am glad that @Joey D wrote this article. The festival playlist is a huge disappointment that could kill FH4. I hope they take these responses seriously and turn one of these worst updates into something more enjoyable to the players. Joey D and FosterG like this. The update is definitely terrible and I haven't bother to return to it since I have no interest on the 50% car unlock and getting 100% is a chore. As for now I'll pop back in during Spring to get the Z4 but for now I'll just enjoy some other games. If it is changed to 25% and 50% for each car it will be better or just switch it back to championship completion unlock. The best method will probably be just have everything unlocked like FM7 and keep the FE cars exclusive. FosterG and WanganDream like this. I am not even going to attempt 100%, just went back to Forza seven to drive some of the cars I have not been able to get in Horizon, wondering what the next move is. As I said the Forza Horizon 4 General Discussion I used to really like this game, I originally got Forza Horizon 4 to continue on casual gaming after Forza Horizon 3. I was that disgusted by the cars locked away by all those events I would have to do & not only a select few to get those cars. At the most only thing I do with other players on occasion is Forzathon live. When I not do that I just drive around in free roam. Personally I rather that the cars locked away behind these events become DLC cars honestly where I could just buy them in a car pack & add them to my garage. I used to think Forza Horizon was about having a good time & not grinding away for hours on end just to receive one car. It is absolutely ridiculous. huiop2, HarlemG27, FosterG and 1 other person like this. I can say with 100% honesty that I love this update. It's given me so much free time now that I have zero desire to log back on to FH4 every week. ImaRobot, Canucks_9419, bremics and 5 others like this. After reading these comments, I have to say that I disagree with majority, if not all of you. I don't want to troll anyone, and I totally respect everyone else's right to their opinion AND their opinion, nor am I drinking M$/T10/PG's cool-aide either. In fact I've been very critical about them, especially with FM7. So with out of the way, I'll get started. The only argument that I agree with 100%, is the crappy servers and people not having reliable internet connection. Those are really a major suckage, if you have to rely on network play to earn a prize. XBL Gold, I just can't see the issue. People have bought the console, right? They've also bought the game, right? I know, there's always birthdays and Christmases, but it seems that majority of people making an issue out of it are grown-ups. XBL membership is an 60€$£ extra/year. That makes a 5€$£/month. It's not that much. Daily challenges. You don't actually need to do them daily. You have three days to complete one, so if you make it to the game three times during a season, you'll be able to complete them. And those challenges aren't really challenges, you'll pretty much get them done just driving or racing around. Ranked adventures. Once you're qualified, you're good for the whole series. And for the next series, run one adventure and you're good again. I know it's an issue if you're just starting out and have to grind through eight (or ten?) adventures to qualify and get the achievement. But compare this to other games with network play, it's a similar situation. You need to play the game to earn the goodies. FH4 is still play-to-win, not pay-to-win game. Playground games (not the publisher). This is something that I have a little issue with. What I've run into is that when a team loses the first round, most of people flee and there is one or two players left. And the fact that you have endure through all five rounds to finish the event, instead of it being best-of-five like free-for-all team adventures. In the end, people can't win every time, so if you don't, just try again. At worst I had to do a second round of games to win the prize. The Trial. It's doable. Just pay attention to what kind of event it is, and pick and tune your car accordingly, and hope that other are people have done the same and/or can drive even a little. Like playground games, you just might have to try again. I don't have time/It can't be done on one sitting. I'm 100% done with summer playlist, and 44%/36%/44% done with the rest. Once you've put in the effort for the first season, it'll get easier and you don't have to spend that much time to achieve the rest. I also happen to work full-time, I have family, I have hobbies, I have active social life, and yet somehow I manage to find time to play almost daily. I don't see lowering the percentage or giving money or wheelspins for 100% achievement as a good solution. What am I going to with the money if can't spend it? I can't buy cars, because I'm about to run out of garage space. And the wheelspins give out duplicates that nobody wants buy in the auction house. While it's unfortunate that not everyone is able to get 100% prizes, I'm okay with the way it is. And finally, if you happen to miss out on a prize, there will be another opportunity to earn it. Have a nice day, people, grandpa has to take off to work!